Image caption The development would come with parking spaces for 813 cars and 119 bicycles. 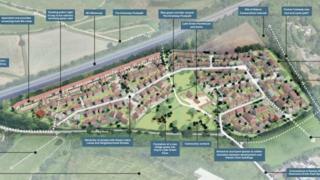 Nearly 400 new homes are planned for farmland near the M4. Developer Edward Ware Homes submitted plans to build 398 homes on land at Lyde Green Farm in Gloucestershire. The developer says the new homes near Emersons Green, of which a third would be "affordable", would help to meet an "acute" need for housing in the area. South Gloucestershire Council is due to decide on the plans, which include a mix of flats and houses, by early June. The Local Democracy Reporting Service said to cut down noise from the M4, the new homes beside the motorway were planned as a series of long, three-storey apartment blocks. Those flats and town houses would have closed-board timber fencing around their gardens, special glazing and no windows in "habitable" rooms facing the motorway. Image caption The council intends to decide on the application by early June. The occupiers of the Lyde Green Farm buildings are the only existing neighbours who will be affected by the proposed development, according to the planning application. The development would come with parking spaces for 813 cars and 119 bicycles. A village green and community orchard would lie between Henfield Road and the farm buildings, and a green corridor would protect the Dramway footpath. A green border would also protect the Avon cycle way on the disused railway line to the east. Traffic access would eventually be via the A41474 ring road and the development would be served by a public transport bus loop that runs through the site and along Henfield Road.